Most of my apps are simple and free. I make a living displaying ads from iAds, MobFox, Admob and inMobi) (in that order order of precedence). Each of them has a paid counterpart that users can get in order to get rid of ads and in certain cases get some small additional feature. To make this clear, the incentive to upgrade isn't huge. This is a deliberate decision. Many users will simply never buy an app, so I believe that at least for commodity apps such as mine it is a better approach to give as much as you can to the free users. My Battery HD app is by far my biggest success. When the app was first released in 2009, there was absolutely no link from the free version to the pro version. As a result the transformation rate from free to pro was about 0.07%. At this level I don't know if you can call it a transformation rate, it might be just plain coincidence. In early 2010 the app got up to 20'000 free downloads each a day. This would transform into maybe 10 to 20 sales at 0.99$ each. I was making between 8 and 14$ a day from sales while the free app was getting downloaded by twenty-five thousand people each day. Ads were making a lot of money but surely sales could be improved. In July 2011 - seasonal or not - the falling ad prices on every network really divided my revenue by two, so I was glad I had taken some steps to increase sales which remain stable despite the varying advertising market prices. 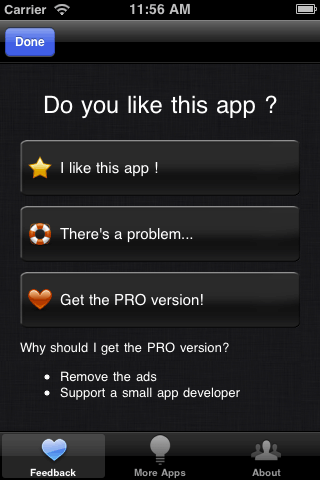 I added to the ad area a simple white text on black background saying Get the PRO version!. This was displayed while loading the first ad or if no ad could be displayed. That's it. Note that those items were translated into several languages (using icanlocalize as usual). This might have helped too. That was enough to multiply the revenues by a factor of 8 to 10. At this point sales started making about 200 $ per day. By that time the app was still ranking high in Europe and daily downloads were still at about 20'000 per day, meaning 1% of the users who got the free app purchased the paid version. I should have done that from the start. One percent might not seem much but then again, you have to consider what they get for this: just remove the ads. We're not talking about OmniFocus or some professional tool here after all. It just tells you for how long you can listen to music or whatever. It isn't easy to sell something you could easily replace by doing a multiplication in your head. Revenue decreases? Let's double the the price. Many months later the number of daily free downloads had fallen to about 8'000. This was still pretty good considering the app wasn't anymore in the top 50 rankings in any big country and hadn't been updated in a while because I was focused on other stuff: I was very busy drinking coconut water in Rio. The size of the iPhone market itself was growing constantly so the numbers were still decent. One day, after I had drunk too much coconut water I had an epiphany: people who were ready to pay 0.99$ for a premium version with no additional features wouldn't be afraid to pay 1.99$. And so I did raise the price with the next (purely bugfix) update. It turned out my intuition was absolutely right. The number of sales hardly changed when doubling the price. As a result revenue doubled. It went from 61$ on April 11 to 136$ on April 12. I first thought it was peak due to the update but until now this revenue has remained stable. It even slightly increased with release 2.0 of the app which finally added much requested features. In my previous post I bragged at how I went from 5 to 185 reviews thanks to my shiny new magical about box. In addition to efficiently redirecting users to either reviews or support e-mails this about box also explained better why one should get the pro version with a list of arguments. Here's what users saw in the free version when hitting the '+' button. As you can see there are simple and short arguments, again translated in close to 20 languages (more than the rest of the app itself since it is global code all my apps share). Previously there were no arguments, just the button and it wasn't as cute. The app was released in september 2009 but this graphic only shows what happened in 2011. One can clearly see the price change on April 12 (doubling revenue) and the bump for the 2.00 release on May 25. As you can see on the far right this last day of sales was my highest ever. Jumping from 158 $ the day before to 278 $ on August 4. The change from free downloads went from 9'500 to 11'800. So the update clearly convinced a higher number of users to pay. Since there's always a peak on the day the update is released it's hard to say whether this will last. But the peak is definitely much higher than with the previous update which had a similar number of updates and sales. I'll try to update this post with more sales number to see what happens after the peak falls off.